The Liberals and New Democrats signed an agreement on Monday to form an unprecedented coalition government, with a written pledge of support from the Bloc Québécois, if they are successful in ousting the minority Conservative government in a coming confidence vote. 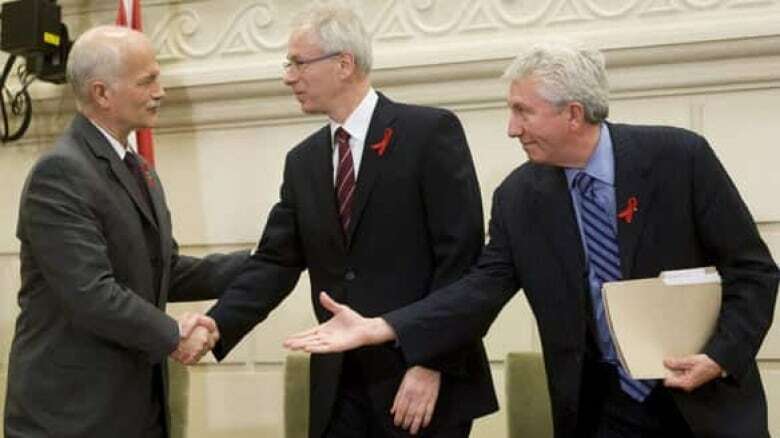 The accord between parties led by Stéphane Dion, Jack Layton and Gilles Duceppe came just hours after Liberal caucus members agreed unanimously that Dion would stay on to lead the Liberal-NDP coalition, with support in the House of Commons from Bloc MPs. The six-point accord includes a description of the role of the Liberal and NDP caucuses, which would meet separately and sit next to each other on the government benches in the House of Commons, Dion told a news conference alongside Layton and Duceppe. Dion said he has advised Gov. Gen. Michaëlle Jean in a letter that he has the confidence of the Commons to form the government should Stephen Harper's Conservatives be defeated in a confidence vote. The Liberal leader said the parties reached the accord after watching the "sad spectacle" of other countries' governments acting to counter the "unprecedented" global economic crisis while Harper's Conservatives "sat and did nothing." "Given the critical situation facing our fellow citizens and the refusal and inability of the Harper government to deal with this critical situation, the opposition parties have decided that it was now time to take action," he said. "We are ready to form a new government that will address the best interests of the people instead of plunging Canadians into another election." 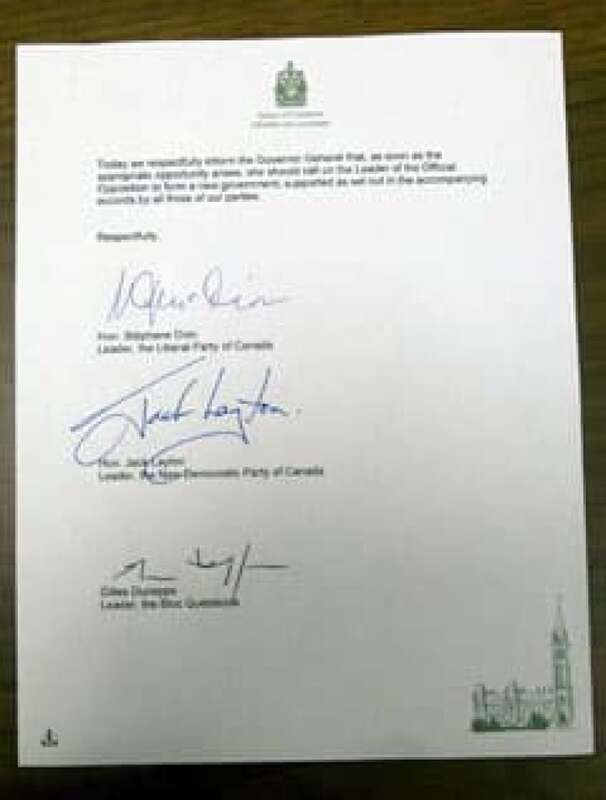 The agreement between the NDP and Liberals would expire on June 30, 2011, unless renewed. The Bloc is only committed to 18 months. Dion, who previously announced he would step down as Liberal leader, also pledged he would hand over "a strong government for a stronger Canada" to his Liberal successor on May 2. "I am honoured to do that," Dion said. Layton said the accord's proposed multibillion-dollar stimulus package for the troubled economy, which includes support for the auto and forestry sectors, is "prompt, prudent, competent and, most important, effective." "This Parliament has failed to act, and it falls on us to act," Layton said. The NDP leader also called on the prime minister to "accept this gracefully" and not bring further instability by fighting the verdict of his colleagues in the House. "Prime minister, your government has lost the confidence of the House and it is going to be defeated at the earliest opportunity," he said. Following the opposition news conference, Harper dispatched Environment Minister Jim Prentice to address the "serious" situation. Prentice called the opposition pact "irresponsible and undemocratic" and said the government will consider all options. He wouldn't rule out the government's asking Jean to suspend Parliament until late in January, when the Tories have promised to introduce a new budget. The proposed coalition cabinet will comprise 24 ministers and the prime minister. Six of these ministers will be appointed from within the NDP caucus. The position of finance minister would be held by a Liberal, while the NDP would be allotted six parliamentary secretaries. The accord between the NDP and Liberals will expire on June 30, 2011, unless it is renewed. The Bloc is only committed to 18 months. It includes a "policy accord" to address the "present economic crisis," which states that the accord "is built on a foundation of fiscal responsibility." An economic stimulus package will be the new government's top priority, while other policies include a commitment to improve child benefits and childcare "as finances permit." There is also a commitment to "pursue a North American cap-and-trade market" to limit carbon emissions. The Bloc would not officially be a part of the coalition, but the new government's survival would depend on its support. Duceppe said his party entered into an agreement that is "in the best interests of Quebec, of Quebecers during this time of economic difficulties." "We chose for the time being to give priority to the economic situation and to the assistance we must provide to people," he said. He added he did not agree to support the coalition beyond the 2011 date because the various parties could not agree on "concrete action to recognize the Quebec nation." Parliament is due to vote on a Liberal no-confidence motion on Dec. 8. If Harper's government were to lose a confidence vote, Dion would request that Jean approve the proposed plan to form a coalition government. But the Governor General, who is currently on a state visit in Europe, could also decide to send Canadians to the polls for a second time in less than two months. The prime minister could also still block coalition efforts by proroguing Parliament — that is, suspending it without dissolving it. Dion, who has been blamed by some for the Liberals' poor showing in the October election, had agreed to step down as party leader in May. However, in the hour-long meeting on Monday, Dion received support from all three Liberal MPs vying to replace him, Michael Ignatieff, Bob Rae and Dominic LeBlanc, the CBC's Susan Bonner reported from outside the House of Commons. The three leadership candidates emerged from the meeting together and told reporters they agreed to Dion's presence, but insisted the campaign to replace him will continue "in the normal fashion." 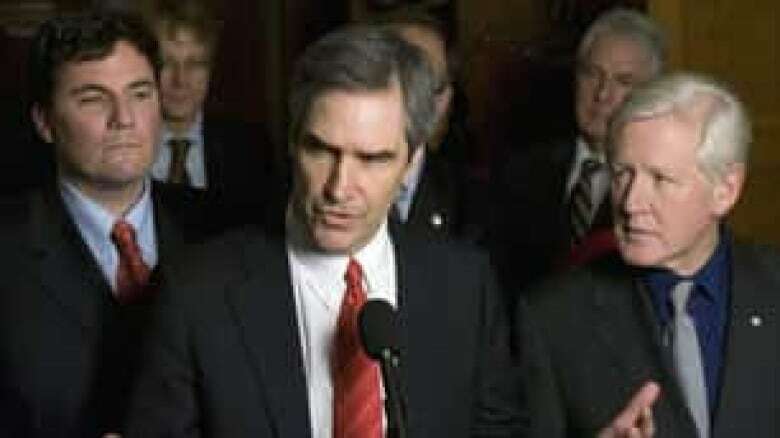 Ignatieff, who is the front-runner to succeed Dion in an upcoming leadership convention, said the three candidates were "at one" in their belief that "the only leader who can lead us in this context is the duly elected leader of the Liberal party." "I support the accord because it's fiscally responsible, it provides responsible economic leadership in tough times and it also conserves the basic principles of national unity, equality that our party has always believed in," he said. Rae described the caucus meeting as "historic" and "moving," while also saying the deal was "perfectly constitutional" and would present for Canadians "the very best possible government." The opposition parties say they have lost confidence in the Harper government after last Thursday's economic update by Finance Minister Jim Flaherty failed to provide a stimulus package for Canadians. Since then, the Liberals had been in negotiations to form a coalition with the NDP, planning to oust the Conservatives in a confidence vote. 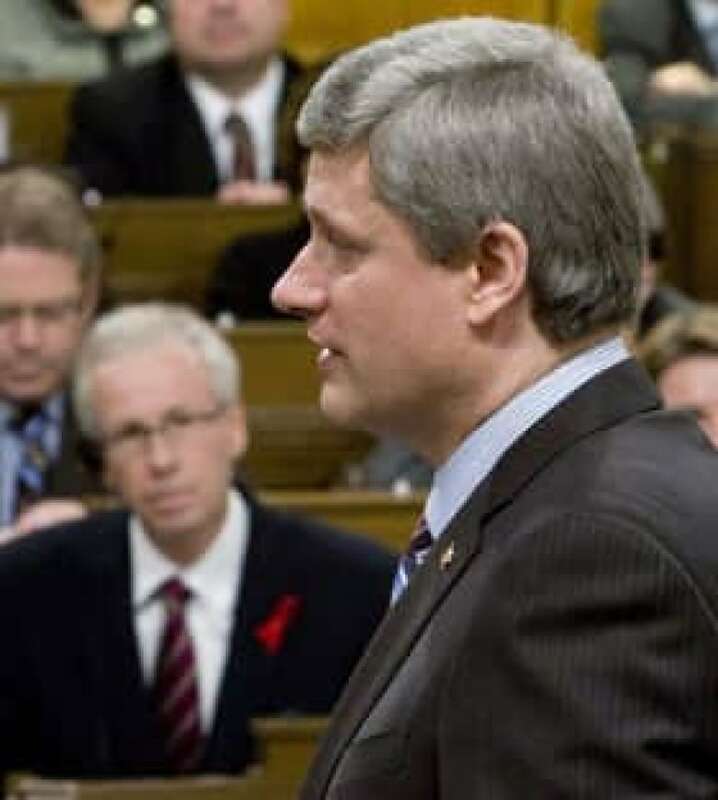 During question period in the House of Commons on Monday, Dion challenged Harper to allow his government to face a vote. "Does the prime minister still believe that he enjoys the confidence of this House?" Dion asked. A fiery Harper, in turn, accused Dion of "playing the biggest political game in Canadian history," saying the Liberal leader would recklessly attempt to govern the country amid a global economic crisis under threat of veto by "socialists and separatists." Dion reminded the House that in 2004, in a letter to the Governor General, Harper — then-opposition leader — proposed that he be allowed to form a government if Paul Martin's Liberal minority government were to fall. Earlier Monday, former NDP leader Ed Broadbent, who took part in the talks, told reporters that "a very constructive, positive agreement has been reached between the Liberal Party of Canada and the New Democratic Party that will bring stimulus to the economy, which is badly needed." "There are going to be a lot of jobs, a protection of pensions and I think we can look forward to a very constructive period," he told reporters, saying the deal included aid for the suffering auto and forestry sectors. The Canadian Press reported a source saying mid-Monday that the parties had agreed to present a $30-billion stimulus package that would offer substantial aid to the troubled auto and forestry industries. The source said the deal also calls for the formation of an economic advisory panel of experts that would include Paul Martin, John Manley, Frank McKenna and Roy Romanow. Details of the agreement were fleshed out Sunday night. If the prime minister moved to prorogue Parliament, the Conservative government could not be defeated in the current session of the House. But Harper would also need the approval of the Governor General to do that. But Rae said a move to prorogue would lack legitimacy, as it would clearly be to avoid a vote of confidence. "Mr. Harper has no one to blame but himself for the fact that he's not been able to gain the confidence of the majority of the House," he told the CBC's senior parliamentary editor, Don Newman. On Sunday, Flaherty said the government would deliver the budget on Jan. 27, about a month before one would normally be tabled in the House. Shortly after Flaherty's announcement, Transport Minister John Baird said the minority government wouldn't try to eliminate federal civil servants' right to strike over the next couple of years, as pledged in last week's economic update. On Saturday, Baird also announced the government had shelved its contentious plan to eliminate political party subsidies that are based on the number of votes received during elections.